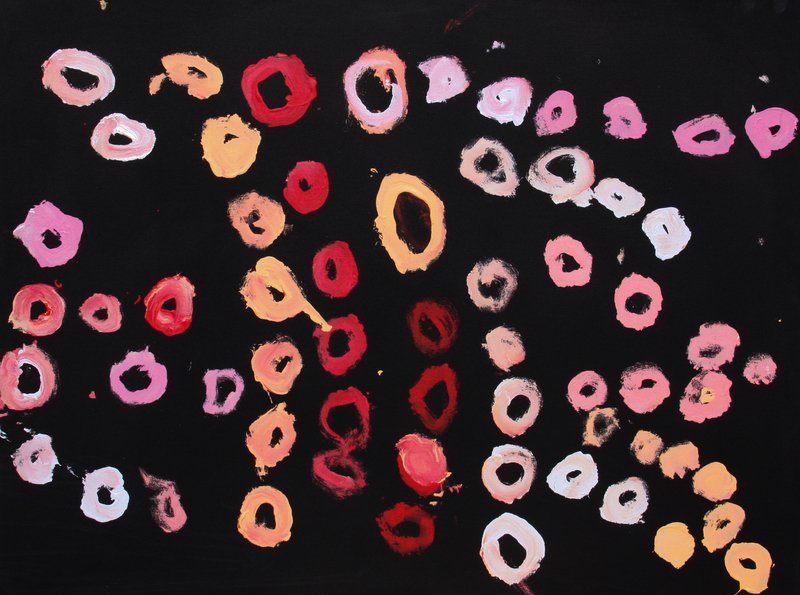 In association with Warakurna Artists in Western Australia, we are delighted to present a selection of 15 paintings by five of the art centre’s Elders, three of whom are sadly now deceased. Warakurna Artists is one of the jewels of the Western Desert. Over the years it has earned its reputation for outstanding art based on the exquisite artistic interpretations of the artists’ traditional Tjukurrpa (Dreaming). The older women’s painting style is typified by layers of loose overdotting, giving the effect of colourful confetti or gemstones strewn across the canvas. This technique is often used to mask sensitive areas of the story depicted in the painting. Generally speaking, the men’s work is stylistically more varied, although Neville Mcarthur’s spare gestural marks are similar to those of the late Tjunka Lewis. The later works of these very senior, old men eschew any form of describing the country in a worked-up dotted surface. This small selection of works is an opportunity to reflect on the wisdom of these bush-born elders and their unique approach to painting that defines an extraordinary moment in time; a time that can never be repeated and is therefore precious. In the past century, the changes and hardships forced on them and their families by modern Australian life and its advancing technologies have been staggering. Throughout, they have adapted, survived and innovated, their indomitable spirit never broken. The knowledge now encapsulated in these paintings is not just about their ancient ancestral histories, but their contemporary Australian history, too. Neville Niypula Mcarthur (born c. 1938) is originally from Spinifex country, south of Warburton. His paintings relate to his home Country, a place so sacred, he cannot describe it. 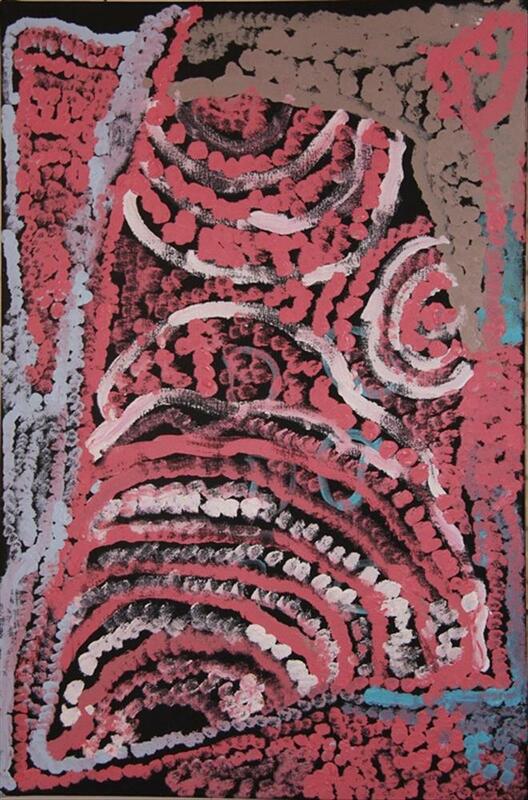 Mcarthur as previously painted for Spinifex Arts Project, Warburton Arts Project and Kayili Artists. Since 2010 when he moved into aged care at Wanarn, Mcarthur paints for Warakurna. His work is represented in the Museum of Western Australia, University of Queensland, Warburton Arts collection and several significant private collections. Elaine Lane (b. 1940) is a renowned Tjanpi weaver and talented painter. She and a team of Blackstone women won the 2005 Telstra National Aboriginal and Torres Strait Islander Art Award for their life-size grass weaving of a Toyota tray top ute. 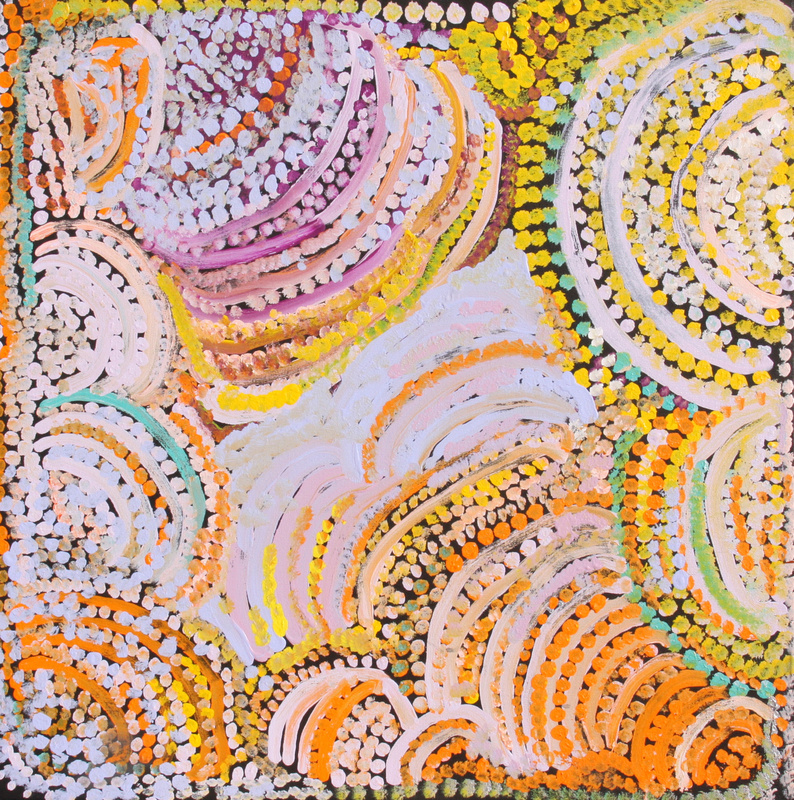 Her themes are Pukara, Warrutjarra and Wati Kutjarra. Elaine’s style is defined by her delicate dotting and an occasional use of human or animal figures. She is the sister of Jimmy Donegan and Pantjiti Mary McLean. 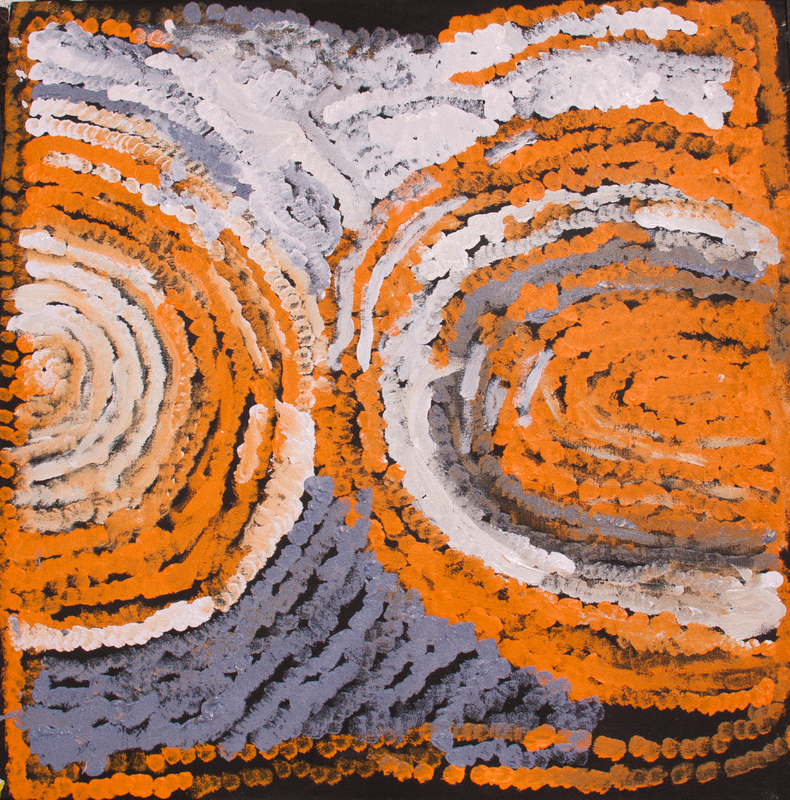 Lane is known as a Papulankutja artist, however she has been painting for Warakurna since early 2017 after moving into aged care in Wanarn. Carol Maanyatja Golding (c. 1930 – 2/2016) was born between Blackstone and Warakurna. Orphaned at a yound age, she was taken in by Rachel Jennings’ and Eunice Porter’s family. 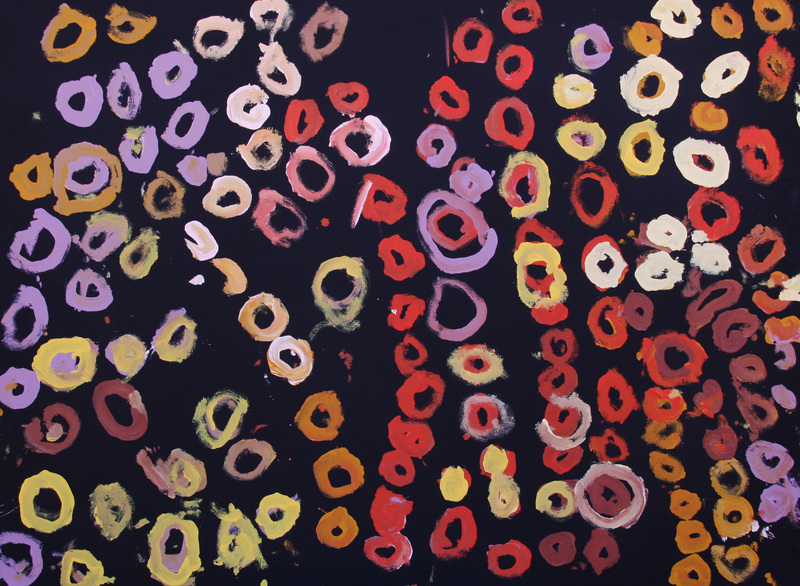 Golding had previously painted for the Warburton Arts Project, but moved to Warakurna Artists in 2005, where she remained until her death in 2016 at Wanarn aged care. Her work is represented in several public collections including National Gallery of Australia, National Gallery of Victoria, and Art Gallery of NSW, as well as significant private collections. 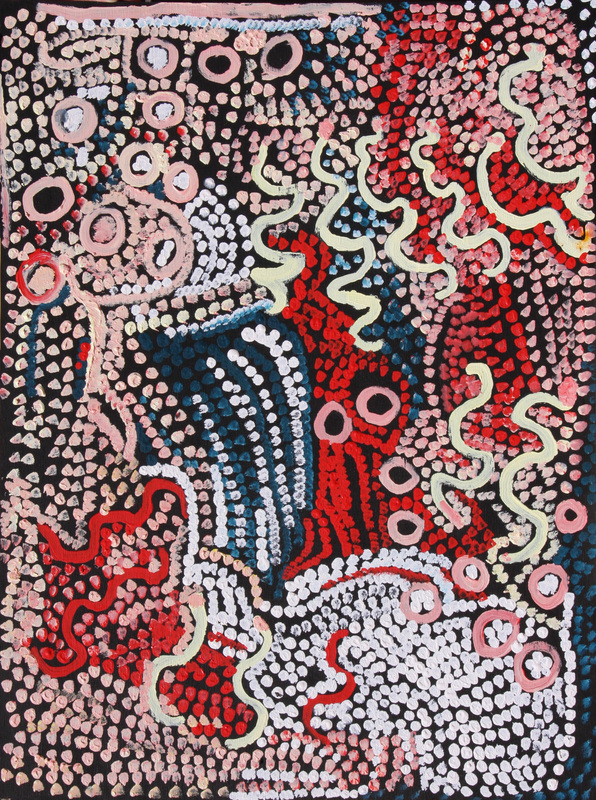 Myra Yurtiwa Cooke (c. 1932 – 2015) was born between Warakurna and Tjukurla (Tjarlirli Art). Her father’s Country was near the border of Western Australia and the Northern Territory, where she spent time as a child. When her mother remarried, the family moved westwards to her stepfather’s Country near Wanarn. Like many of the early artists at Warakurna, Cooke painted for Warbarton Arts Project before moving to Warakurna in mid 2005. Cooke was a close painting associate of Golding and the women were considered to be two of the most important painters from the region. Cooke is represented in the National Gallery of Victoria and several significant private collections. 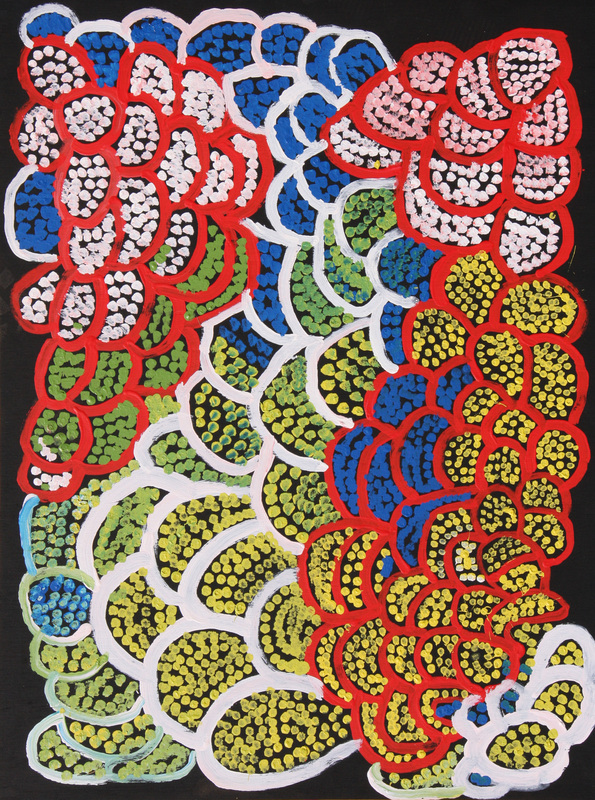 Rachel Yukultja Jennings (1937 – 2015) was born in Mantamaru in Western Australia, close to the tri-state border. Her youngest sister is fellow Warakurna painter, Eunice Porter. Jennings spent most of her adult life in and around Warburton where she painted for Warburton Arts Project. 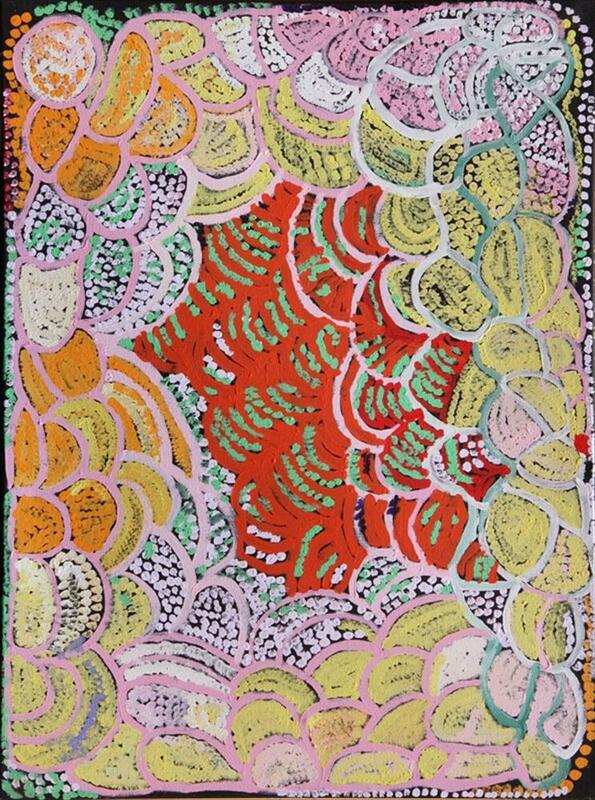 Jennings began painting for Warakurna Artists when she moved into Wanarn aged care. Jennings is represented in significant private collections in Australia and the USA. Acrylic on canvas, 76.2 x 101.6 cm. Acrylic on canvas, 50.8 x 101.6 cm. Acrylic on canvas, 76.2 x 76.2 cm. Acrylic on canvas, 50.8 x 76.2 cm. Acrylic on plywood board, 60 x 80 cm. Acrylic on canvas, 38.1 x 76.2 cm. Acrylic on plywood board, 80 x 60 cm.